Thomas G. Weinandy was born January 12, 1946, in Delphos, Ohio. 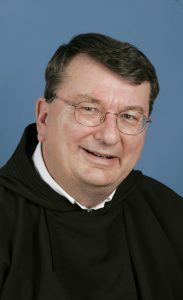 He entered the Order of Friars Minor Capuchin in 1966, was solemnly professed in 1970, and was ordained to the priesthood in 1972. He earned a B.A. in Philosophy at St. Fidelis College, Herman, Pennsylvania in 1969, an M.A. in Systematic Theology at Washington Theological Union in 1972, and a Doctorate in Historical Theology at King’s College, University of London, in 1975. Father Weinandy’s major fields of specialty are History of Christology, especially Patristic, Medieval and Contemporary, History of Trinitarian Theology, History of Soteriology, and Philosophical Notions of God. He has held academic positions at Georgetown University, Mount St. Mary’s College, Emmitsburg, Maryland, Franciscan University of Steubenville, and Loyola College, Baltimore. Father Weinandy has served at the University of Oxford since 1991. He is the Warden of Greyfriars and tutor and lecturer in History and Doctrine in the Faculty of Theology. He was Chairman of the Faculty of Theology from 1997 to 1999. He also administers the Greyfriars Year Abroad Program. Father Weinandy is a member of the Catholic Theological Society of America, the Fellowship of Catholic Scholars, the Catholic Theological Society of Great Britain, the North American Patristics Society, and the Association Internationale D’Etudes Patristiques. His books include Does God Change? The Word’s Becoming in the Incarnation, which has been translated into Romanian; In the Likeness of Sinful Flesh: An Essay on the Humanity of Christ; The Father’s Spirit of Sonship: Reconceiving the Trinity; Does God Suffer, which has been translated into Polish; The Lord Jesus Christ: An Introduction to Christology and Soteriology; Jesus the Christ; Receiving the Promise: The Spirit’s Work of Conversion; Be Reconciled to God: A Family Guide to Confession; and Sacrament of Mercy: A Spiritual and Practical Guide to Confession. Father Weinandy has published scholarly articles in such journals as The Thomist, New Blackfriars, Communio, First Things, Pro Ecclesia, Logos: A Journal of Catholic Thought and Culture, and the International Journal of Systematic Theology. His popular articles include those written for New Covenant, National Catholic Register, Pastoral Life, Canadian Catholic Review, New Oxford Review, the Arlington Catholic Herald, and The Family. CURRICULUM VITAE: Revd. Dr. Thomas G. Weinandy, O.F.M. Cap. B.A. in Philosophy – St. Fidelis College, Herman, Pennsylvania, 1969. M.A. in Systematic Theology – Washington Theological Union, 1972. Ph. D. in Historical Theology – King’s College, University of London, 1975. Incarnation. This was written under the supervision of E.L. Mascall and H.P. 1. History of Christology – especially Patristic, Medieval, and Contemporary. 3. History of Soteriology – especially Patristic, Medieval, and Contemporary. Georgetown University – 1976 – 1980. Mount St. Mary’s College (Emmitsburg, Maryland) – 1980 – 1982. Franciscan University of Steubenville – 1982 – 1984. Loyola College (Baltimore, Maryland) – 1984 – 1986. Greyfriars Hall, University of Oxford (England) 1991-2004. The Warden of Greyfriars: 1993 to 2004. Tutor and Lecturer in History and Doctrine, Faculty of Theology, 1991 to 2004. Elected to a Special University Research Lectureship in Trinity Term 2000. Member of the Board of the Faculty of Theology from 1994 to 2004. Chairman of the Faculty of Theology: 1997 to 1999. Finances and General Purposes Committee: 1994 to 2002. The Committee for the Nomination of Examiners in Theology: 1999 to 2002. The Committee for the Oxford Theological Exchange Program: 2001. Member of the Westminster Validation Committee: 2002. Member of the Search Committee for the Leventus Lectureship in Patristics in 2003. Theology Faculty Centre in 1993. The Catholic Theological Society of America. The Fellowship of Catholic Scholars. Catholic Theological Society of Great Britain. The North American Patristics Society. Founding member of the Academy of Catholic Theology. Member of the Board for the Oxford Patristics Conference 2003-04. Does God Change? The Word’s Becoming in the Incarnation (Petersham: St. Bede’s Publications, 1985). This book has been translated into Romanian: Iisus Hristos – Dumnezeu întrupat (Cluj: Napoca Star, 2001). In the Likeness of Sinful Flesh: An Essay on the Humanity of Christ (Edinburgh: T & T Clark, 1993). The Father’s Spirit of Sonship: Reconceiving the Trinity (Edinburgh: T & T Clark, 1995). Does God Suffer? (Edinburgh: T & T Clark and University of Notre Dame Press, 2000). This book has also been translated into Polish. The Lord Jesus Christ: An Introduction to Christology and Soteriology (Birmingham: Maryvale Institute, 2000). The Theology of Cyril of Alexandria: A Critical Appreciation (ed. with Daniel A. Keating), (London: T&T Clark/Continuum, 2003). In this volume I contributed an essay entitled: ‘Cyril and the Mystery of the Incarnation’. Jesus the Christ (Hunington IN: Our Sunday Visitor Press, 2003). Aquinas on Doctrine: A Critical Introduction, (edited with Daniel A. Keating and John Yocum), (London: T&T Clark/Continuum, 2004). In this volume I contributed an essay entitled: ‘Aquinas: God IS Man: The Marvel of the Incarnation’. Aquinas on Scripture: An Introduction to his Biblical Commentaries. (edited with Daniel A. Keating and John Yocum), (London T&T Clark/Continuum, 2005). In this volume I contributed an essay entitled: ‘The Supremacy of Christ in the Letter to the Hebrews’. Athanasius: A Theological Introduction (London: Ashgate, 2007). International Theological Commission, Volume II, Texts and Documents, 1986-2007, (edited with Michael Sharkey), (San Francisco: Ignatius Press, 2009). ‘Aquinas and the Incarnational Act: “Become” as a Mixed Relation,’ Doctor Communis, 32 (1979) 15-31. ‘Spirituality and the Sacramental Life of the Church,’ Proceedings of the Ninth Convention of the Fellowship of Catholic Scholars, ed. P. Williams, (Pittston, Pennsylvania: Northeast Books, 1987), pp. 17-27. ‘The Renewal of the Church: Toward the 21st Century,’ Proceedings of the Tenth Convention of the Fellowship of Catholic Scholars, ed. P. Williams, (Pittston, Pennsylvania: Northeast Books, 1988), pp. 219-231. This article was also published in The Battle for the Catholic Mind, eds. W.E. May & K.D. Whitehead (South Bend: St. Augustine’s Press, 2001), pp. 379-94. ‘Campus Ministry and Catholic Higher Education,’ Proceedings of the Eleventh Convention of the Fellowship of Catholic Scholars, ed. P. Williams, (Pittston Pennsylvania: Northeast Books, 1989), pp. 123-125. ‘The Christian Meaning of Human Suffering,’ Epiphany, 13/3 (1993) 30-37. ‘Conversion and Reconciliation: The Task of the Church,’ Epiphany, 13/4 (1993) 70-77. ‘The Immanent and the Economic Trinity,’ The Thomist, 57 (1993) 655-666. ‘Maurice Wiles and Christian Doctrine,’ New Blackfriars, 75 (1994) 166-170. ‘The Case For Spirit Christology: Some Reflections,’ The Thomist, 59 (1995) 173-88. ‘Gnosticism and Contemporary Soteriology: Some Reflections,’ New Blackfriars, 76 (1995) 546-554. ‘The Soul/Body Analogy and the Incarnation: Cyril of Alexandria,’ Coptic Church Review, 17/3 (1996) 59-66. ‘Clarifying the ‘Filioque’: The Catholic-Orthodox Dialogue,’ Communio, 23/2 (1996) 354-367. ‘The Human ‘I’ of Jesus,’ The Irish Theological Quarterly, 62/4 (1996/97) 259-268. ‘Fides et Ratio: A Reply to John Webster,’ New Blackfriars, 81(2000) 225-235. ‘The Cosmic Christ,’ The Cord, 51(2001) 27-38. ‘The Symbolic Theology of Roger Haight,’ The Thomist, 65/1(2001)121-136. ‘Origen and the Suffering of God,’ Studia Patristica, Vol. 36 (Leuven: Peeters, 2001), pp. 456-460. ‘Faith and Reason in the Teaching of John Paul II,’ in The Wisdom of John Paul II (London: Catholic Truth Society, 2001), pp. 87-100. ‘Does God Suffer?,’ First Things, Nov. 2001, Num. 117, pp. 35-41. ‘Doing Christian Systematic Theology: Faith, Problems, and Mysteries’ Logos,: A Journal of Catholic Thought and Culture, 5/1(2002)120-138. ‘Does God Suffer?’ in the electronic journal Ars Disputandi, Spring 2002. ‘Zizioulas: The Trinity and Ecumenism,’ New Blackfriars, 83 (2002) 407-415. 11 entries on various attributes of God in the revised New Catholic Encyclopaedia (Washington, D.C.: Catholic University Press, 2002). ‘Easter Saturday and the Suffering of God: The Theology of Alan E. Lewis,’ International Journal of Systematic Theology, 5/1 (2003) 62-76. ‘Huckleberry Finn and the Adventures of God,’ Logos: A Journal of Catholic Thought and Culture, 6/1 (2003) 41-62. ‘Irenaeus and the Imago Dei: The Importance of Being Human,’ Logos: A Journal of Catholic Thought and Culture, 6/4(2003) 15-34. ‘Christology: Some Contemporary Issues,’ Priests and People, 17/12(2003) 460-64. ‘Jesus Filial Vision of the Father,’ Pro Ecclesia, 13/2(2004)189-201. ‘Of Men and Angels,’ Nova et Vetera, 3/2(2005)195-306. ‘Faith and Reason: John Paul and Aquinas,’ Nova et Vetera, 3/3(2005)603-13. This article was subsequently published in John Paul II & St. Thomas Aquinas, eds. M. Dauphinais and M. Levering (Naples: Sapientia Press, 2006), pp. 175-185. ‘The Apostolic Christology of Ignatius of Antioch: The Road to Chalcedon,’ in Trajectories through the New Testament and the Apostolic Fathers, eds. A. Gregory and C. Tuckett, (Oxford: Oxford University Press, 2005), pp. 71-84. ‘Deus Caritas Est: Defining the Christian Understanding of Love,’ Pro Ecclesia, 15/3(2006)259-262. ‘The Catholic Laity: Priests, Prophets and Kings,’ Voices, 21/3(2006)12-15. This article was also published in an abbreviated form in Christ the King OCDS Community Bulletin, August/September, 2009, pp. 15-17. ‘The Beatific Vision and the Incarnate Son: Furthering the Discussion,’ The Thomist, 70/4(2006)605-15. ‘Athanasius: The Incarnation and the Soul of Christ,’ in Studia Patristica XLI, eds. M. J. Edwards, F. M. Young and P. Parvis, (Leuven: Peeters, 2006), pp. 265-269. ‘Ignatius of Antioch,’ in The New Lion Handbook: The History of Christianity, ed. J. Hill, (London, 2007), p. 51. ‘Cyril of Alexandria,’ in The New Lion Handbook: The History of Christianity, ed. J. Hill, (London, 2007), p. 97. ‘Vatican II: Forty Years Later: Struggles and Initiatives,’ Proceedings from the 28th Annual Convention of the Fellowship of Catholic Scholars, ed. K.D. Whitehead (South Bend: St. Augustine Press, 2007), pp. 1-11. ‘Why Ask the Fathers? The Dynamics of a Living Tradition,’ in the electronic journal American Theological Inquiry, 1/1(2008)6-10. ‘Impassibility of God and Human Suffering,’ in New Dictionary of Theology: Revision (Nottingham: Inter-Varsity Press, 2008), pp. 82-84. ‘Suffering and the Sovereign Love of God: A Conclusion to God’s Sovereignty and Evangelical Theology,’ in The Sovereignty of God Debate, eds. D.S. Long & G. Kalantzis, (Eugene: Cascade Books, 2008), pp. 139-52. ‘Pope Benedict XVI: A Biblical Portrayal of Jesus,’ Nova et Vetera, 7/1(2009)19-34. ‘God and Human Suffering: His Act of Creation and His Acts in History,’ in Divine Impassibility and the Mystery of Human Suffering, eds. J.F. Keating and T.J. White, O.P., (Grand Rapids: Eerdmans, 2009), pp. 99-116. ‘The Council of Chalcedon: Some Contemporary Christological Issues,’ Theology Digest, 53/4(2006)345-356. This issue was actually published in September 2009 and my lecture was given in March 2009. ‘Terrence Tilley’s Christological Impasses: The Demise of the Doctrine of the Incarnation,’ Fellowship of Catholic Scholars Quarterly, 32/3(2009)4-10. This essay was also published in Origins, January 21, 2010, 39/32, pp. 526-531. ‘Dei Verbum: Catholicism and the Necessity of Revelation,’ Chicago Studies, 48/2(2009)207-213. ‘Human Suffering and the Impassible God,’ Testamentum Imperium: An International Theological Journal [electronic journal], 2(2009)1-18. ‘Henri de Lubac: The Church as the Body of Christ and the Challenge of Ethnic Nationalism,’ Nova et Vetera, 8/1(2010)161-183. ‘Athanasius’ Letter to Marcellinus: A Soteriological Praying of the Psalms,’ Studia Patristica, XLVI, eds. J. Baun, A. Cameron, M. Edwards, and M. Vinzent (Leuven: Peeters, 2010), 275-279. ‘The Human Acts of Christ and the Acts That Are the Sacraments,’ Ressourcement Thomism: Sacred Doctrine, the Sacraments, & the Moral Life, eds. R. Hütter & M. Levering (Washington DC, CUA Press, 2010), pp. 150-168. ‘Reason, Faith and Obedience,’ Logos: A Journal of Catholic Thought and Culture, 13/4(2010)133-155. I have three essays that will appear in separate edited books: ‘Mary in the Middle Ages: The Annunciation – The Undoing of Eve;’ and ‘The Incarnation’ and ‘Creation’ (Oxford Handbook on Catholicism). I have also reviewed numerous books in such journals as Theological Studies, The Thomist, New Blackfriars, Pro Ecclesia, The Irish Theological Quarterly, The New Oxford Review, Priest and People, Modern Theology, The Expository Times, Nova et Vetera, Thomistica, Journal of Early Christian Studies, First Things and International Journal of Systematic Theology. Maryvale Institute in Birmingham, England, 1992-2004. Thomist Institute at the University of Utrecht, Holland, 1997. The International Theological Institute in Gaming, Austria, 1999. The University of Notre Dame, 2001. Fellowship of Catholic Scholars Conventions (USA), 1986, 1987, 1989, 2005. The International Patristics Conference (Oxford, England), 1995, 1999, 2003, 2007. ‘John Paul II and the Renewal of Thomism’ Conference, Ave Maria College, Ypsilanti, MI, 2004. North American Patrisitics Society Convention, 2006. Second Annual Fr. Ronald Lawler O.F.M., Cap., St. Paul Institute, Pittsburgh, PA, 2006. Franciscan University of Steubenville, Steubenville, OH, 2006. University of St. Thomas, St.Paul/Minneapolis, MN, 2007. ‘Divine Impassiblity and the Mystery of Human Suffering’ Conference, Providence College, Providence RI, 2007. Garrett Theological Seminary, Evansville, IL, 2007. ‘The Cardinal Stafford Lectures,’ St. John Vianney Theological Seminary, Denver, CO, 2007. Commencement Address, University of St. Francis, Joliet, IL, 2008. ‘The Kenrick Lecture,’ Kenrick-Glennon Theological Seminary, St. Louis, MO, 2009. Receiving the Promise: The Spirit’s Work of Conversion (Gaithersburg, Maryland: The Word Among Us Press, 1985). Be Reconciled to God: A Family Guide to Confession (Gaithersburg, Maryland: The Word Among Us Press, 1988). Sacrament of Mercy: A Spiritual & Practical Guide to Confession (Boston: Pauline Books, 1997). This book has been reprinted (Lima, OH: Academic Renewal Press, 2005) and (Eugene, OR: Wipf and Stock, 2010). ‘Conversion,’ New Covenant, Vol. 15, No. 5 (1985) 28-31. ‘Is Mary Appearing At Medjugorje?,’ National Catholic Register, May 5, 1985. ‘Christian Forgiveness: The Prodigal Son,’ National Catholic Register, June 29, 1986. ‘Christian Forgiveness: The Good Samaritan,’ National Catholic Register, July 6, 1986. ‘Christian Forgiveness: The Lord is Tested,’ National Catholic Register, July 13, 1986. ‘Conversion: The Heart of the Church,’ Pastoral Life, Vol. 35, No. 9 (1986) 9-15. ‘The Process of Conversion,’ Pastoral Life, Vol. 35, No. 10 (1986) 8-17. ‘Jesus our Brother, Our King,’ National Catholic Register, December 21, 1986, p. 5. ‘The God-Man,’ The Canadian Catholic Review, December, 1988, p. 438. ‘Confession for Young People,’ New Covenant, Vol. 18, No. 10 (1989) 30-31. ‘What Is the Pope Up To?,’ Pastoral Renewal, Vol. 14, No. 3 (1989) 10-14. ‘Christian Marriage’ (four articles), The Arlington Catholic Herald, Vol 15, No. 6, February 8, 1990. ‘Giving the Doubter His Due,’ The Canadian Catholic Review, Vol. 8, No. 4 (1990) 159-160. ‘Catholic Marriage’ (four articles), The Arlington Catholic Herald, February 7, 1991, pp. 20-27. ‘The Challenge: Forgiveness,’ Restoration, Vol. 44, No. 2 (1991) 1-2. ‘Evangelium—Srdce Charizmaticke Obnovy,’ Effatha (Prague), II, roenik, 1992. ‘Resentment Is Killing Us?,’ New Covenant, Vol. 22, Num. 5 (1992) 11-13. ‘What Does It Mean to Say that Jesus Saves?,’ The Universe, December 6, 1992, p. 25. ‘How Jesus Shows His Healing Mercy,’ The Universe, December 13, 1992, p. 11. ‘A Sermon for the Feast of All Saints,’ The Allen Review, 9 (1993) 31-33. ‘Christian Marriage’ (three articles), The Arlington Catholic Herald, February 11, 1993. ‘Why Catholics Should Witness Verbally to the Gospel: To Know Jesus is to Know Why,’ New Oxford Review, Vol. 60, No. 6 (1993) 16-18. ‘Let the Children Come: The Sacrament of Reconciliation and Children,’ The Sower, Vol. 15, No. 1 (1993) 19. ‘Conversion and Reconciliation: The Task of the Church,’ Epiphany, Vol. 13, No. 4 (1993) 70-77. ‘Why Catholics find it do hard to Evangelize,’ New Covenant, 23\3 (1993) 18-19. ‘The Poison of Resentment,’ Faith and Renewal, 18\3 (1993) 9-13. ‘On the Grace of Humility,’ Oxford Magazine, 104 (1994) 8-10. ‘Healing Resentment in the Church,’ The Family, May, 1994, 22-24. ‘Poison in the Body of Christ,’ Healing and Wholeness, 17 (1995) 29-31. ‘The Baptism of the Spirit Changed Everything,’ New Covenant, 24\8 (1995) 14-16. ‘Out Loud,’ How I Pray Now, ed. Jim Manney, (Huntington: Our Sunday Visitor, 1997). ‘The Leadership of Peter,’ The Catholic Standard, February 21, 2008, p. 9. ‘Like Peter, Benedict is Today’s Rock,’ USCCB, Papal Visit Blog, March 13, 2008. ‘Counting Our Days Aright,’ Voices: Women for Faith and Family, 23/1(2008)4-6. ‘Using the Old Testament in Daily Prayer,’ USCCB, Website, November, 2008. ‘Eucharistic Adoration: Encountering the Mysteries,’ The Adoremus Bulletin, 15/7(October 2009)3-4. Remarks on receiving the Cardinal Wright Award, The Idea of the Catholic University: Proceeding from the 30th Annual Convention of the Fellowship of Catholic Scholars, ed. K. Whitehead, (Chicago: University of Scranton Press, 2009), pp. 155-159. ‘Charity in Truth,’ Catholic Anchor, 12/8, April 16, 2010, 5. ‘The Christian Family and the Evangelization of Children,’ USCCB, Website, April, 2010. I have also written numerous articles for The Word Among Us (until 1995) in the United States and Bible Alive (until 2004) in Great Britain. I have also given numerous days of recollection, retreats, parish missions, and priests’ convocations, and spoke or lectured at many popular conferences in the United States, Canada, Ireland, England and Scotland. I was the founding Principal of the Mother of God School, Gaithersburg, MD. Elected to the Hall of Fame, Delphos St. John’s High School, 2006. ‘The John Cardinal Wright Award,’ Fellowship of Catholic Scholars, 2007. ‘President’s Medal of Honor,’ University of St. Francis, Joliet, IL, 2008. ‘Peter Richard Kenrick Medal,’ Kenrick Seminary, St. Louis, MO, 2009. From January 2005: Executive Director for the Secretariat of Doctrine at the United States Conference of Catholic Bishops, Washington, D.C.
Consulter to the Reformed/Roman Catholic Dialogue (USCCB). Member of the Board of Directors: St. John Vianney Theological Seminary, Denver, CO.
Editorial Board for the journal Nova et Vetera. Distinguished Fellow at the St. Paul Center for Biblical Theology. Adjunct teacher at the Dominican House of Studies, Washington, DC and the Catholic University of America, Washington, DC. Member of the Board of Advisors: Center for Catholic-Evangelical Dialogue, Dayton University. Archdiocese of Washington, Delegate for Healthcare. Member of the Board for St. Bede’s Hall, Oxford, England. Member of the Board of the Mother of God Trust (UK). Member of the Broader Social Impact Committee, Smithsonian, Nature History Museum, Human Origins Exhibit.